"The Seatles", a home-grown fab-four sing-along band, performed at the Folklife Festival in May and the Columbia City Beatwalk on July 9. Thanks to the great folks at Awash Ethiopian Restaurant for their hospitality and terrific, savory food. The Seatles will go back into hiding for awhile... er, what I meant is we're on our world tour!! Leslie grew up on a remote cattle ranch in Montana. (You gotta love those remote cattle; one click and they line right up!) Greg was raised with more unruly bovines, on a farm in Kentucky. After much wandering, they found each other. Now they live in Seattle and write songs. No cows in sight. to leave us a message (AND INCLUDE YOUR ADDRESS IF YOU WANT A REPLY). 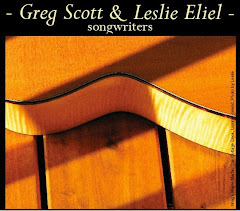 Entertaining and soulful, Leslie Eliel and Greg Scott love their craft and have the musical character and vocal chops to showcase their versatile acoustic/Americana repertoire. Both writers have a knack for making personal insights feel universal and accessible. Their collaborative efforts bring together complementary strengths as writers and performers. Harmonies are intricate and unpredictable, and both voices—a chocolaty contralto and rich dexterous baritone—can support or lead, often blending seamlessly into a haunting unison. We write songs with scrupulous obsession. We sing them with outrageous passion. Image of Albert is public domain. 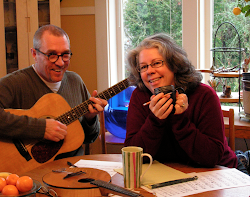 Leslie and Greg are Certified Genuine Songwriters. Lyrics approved for shy adults, mature children, and sensitive animals of all kinds. Occasional diminished chords may appear. See your physician if condition lasts more than four hours.